Opinion: What are our values as a college? | The Gettysburgian. Home » Opinions » Opinion: What are our values as a college? Opinion: What are our values as a college? It seems that every semester there is some event in our campus community that forces us to pause and consider Gettysburg College’s institutional values. Four years ago posters were circulated around campus decrying “anchor babies,” and backlash ensued. During his 2016 campaign, Bernie Sanders rallied in Bream Gym calling for a grassroots revolution led by young people. 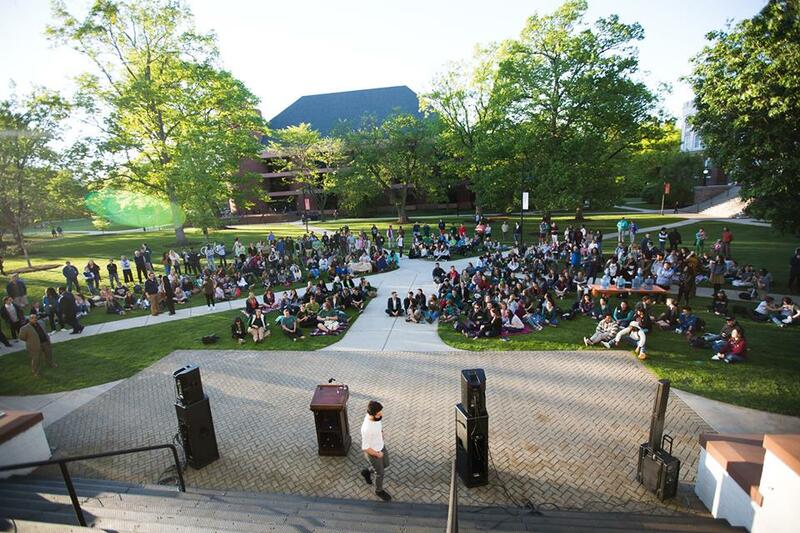 In 2017, Robert Spencer spoke in our ballroom, students organized a Muslim Solidarity Rally on the steps of Pennsylvania Hall, and Todd Green presented on how to refute professional Islamophobia. After the 2016 election, we were forced to consider the lengths to which we would go to protect DACA students. More recently, a trustee has resigned after a yearbook photo surfaced depicting him in a Nazi uniform. The far-spread ramifications of Greek Life—both good and bad—have been an evergreen dispute as well. At the end of fruitful careers, the retirement of coaches, professors, past provosts, community leaders, directors, and even presidents allows us to consider the influence that individuals can have on our values. Sometimes we have the opportunity to ponder our institutional values during celebratory moments like convocation or graduation. During convocation, first-year Gettysburgians are informed that they are joining a community with the highest principles and ideals to become the leaders of tomorrow. Four years later at commencement, those same students gather with a greater appreciation of the privilege afforded to them by a liberal arts education. “Gettysburg College is a residential, undergraduate college of the liberal arts and sciences that prepares students from across the nation and around the globe to pursue lives of personal and professional fulfillment and to engage the complex questions of our time through effective leadership and socially responsible citizenship. This statement serves as a living document in that it can be stretched or compressed when necessary. Our commitment to an inclusive learning environment and sensitivity to the human condition was tested by Robert Spencer. Continued leniency towards toxic social communities on campus question whether the worth and dignity of all people are exalted as proposed. Conflicts between these goals have caused serious consternation amongst students, at one point requiring the development of an institutional philosophy on freedom of expression. As the Managing Opinions Editor of the Gettysburgian, I pose this question to you. What are our values as a student body? If you respond, then perhaps the class of 2019 will be able to graduate with that knowledge. So what is happening with the Garthwait controversy … the committee promised by President Riggs, etc.? Certainly don’t hear anything from the College about it, except for the campus meeting where, as reported in the Gettysburgian, it appeared only one faculty member understood the problem.